Resilience has become a powerful term, used in multiple contexts, at multiple scales. A mutually understood definition, that all who use it adhere to, is lacking, particularly in relation to the future development of cities, and in the developing world. City stakeholders within the Future Resilience for African CiTies And Lands (FRACTAL) project would often ask: but what does this term resilience really mean, what does it mean within the context of cities, and more specifically, what does it mean for African cities? This Think Piece was written in response, based on reflections from a group of FRACTAL project members, largely based on experiences but also additional research. This Think Piece is the first of a series designed to be conversation starters. Definitions of resilience vary, but most relate to the ability of a system to recover while maintaining its functions during and post shocks and stresses. Not all individuals and organisations understand the concept in the same way. In order to take strategic actions that build resilience, it is important that decision makers understand what resilience is, and have engaged with the associated assumptions and differing understandings attached to the concept (UNISDR, 2012). Of vital importance, is for decision makers to then apply the concept within the specific context in which they are operating, in a sensitive and flexible fashion, with a tailored understanding of resilience and the outcomes sought. Cities play a key role as centres of economic activity, opportunity and innovation, but they are also places where stresses accumulate or sudden shocks occur (City Resilience Framework, 2015), due in part to concentrated resource use and human populations in cities, exacerbated by issues such as urbanisation and the tragedy of the commons. These stresses and shocks can potentially result in social breakdown, physical collapse and/ or economic deprivation, unless a city is resilient (City Resilience Framework, 2015). Africa is considered to be one of the continents most vulnerable to the impacts of climate change (IPCC, 2014). African cities are amongst the fastest growing in the world and despite efforts by engineers and city planners, the majority of growth in African cities continues to be in informal settlements. This is partly because infrastructure maintenance and development cannot keep up with urban population growth in African cities, but is primarily an issue of affordability in that many of those moving into the city and/or forming new independent households within the city (i.e. internal growth) cannot afford land, property and rental prices in the formal economy. There is therefore a great need for increased resilience in African cities that connects the formal and informal parts of these cities. Based on the experience of interacting with cities and key decision makers across Africa, a list of considerations have emerged as being critical for building resilience in African cities. These considerations are demonstrated in Figure 1 (above) and summarised below. As cities are interacting systems (Kilcullen, 2012), a systems thinking approach assists in building resilience at the local level (Stockholm Resilience Centre, 2015). Given that cities are highly complex, dynamic and non-linear systems, social, economic, and technical components of cities, designed with both tight and multiple feedback loops are likely to increase resilience (Stockholm Resilience Centre, 2015). 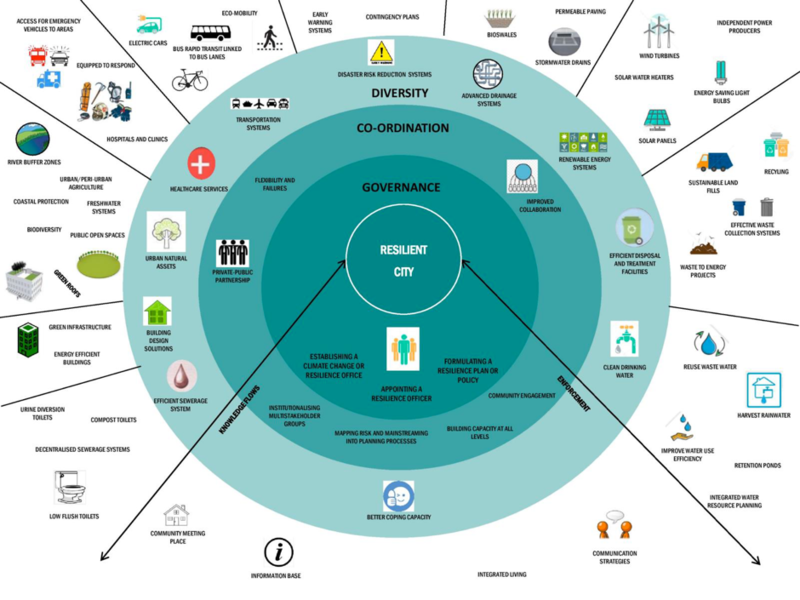 The circles within circles depicted in Figure 1 illustrates the non-linearity of city environments and the need to use a systems approach, in order to build resilience at the local level. A city’s ability to gather and distribute applicable information is key to resilience building (Bornstein, 2013; The Stockholm Resilience Centre, 2015). A resilient city is one that has a solid, experience based knowledge system, where innovative approaches for resilience have been tested to build an evidence base, and can be implemented when necessary. Cities that practice learning by doing, reflection, recording of lessons learned, and effectively integrating them back into the planning process are often more resilient. Improving the link between science/ research and municipal decision making is likely to improve the available knowledge base, enhancing research informed policy. The ability to garner, filter, utilise and distribute relevant information can also be limited by the organisational structure of the responsible authorities (UNISDR, 2012). As cities work to build resilience, procedures that enable city officials to carry out their daily mission while building no regret options for the future, are useful. Resilience is a cross-cutting issue, applicable to multiple sectors. The process of transferring powers, functions, resources and responsibilities from central government to multiple governing bodies that interact within a specific policy arena is considered to be a useful way to achieve collective action in the face of disturbance and change (Stockholm Resilience Centre, 2015). Collaboration across institutions and scales improves connectivity and learning; well-connected governance structures can swiftly deal with change and disturbance by events being addressed by the right people at the right time (ResilientCity.org, 2016; Stockholm Resilience Centre, 2015). Resilience involves cooperative action and setting priorities that are endorsed by multiple stakeholders working across different sectors, scales and perspectives (ARUP, 2014; ULI, 2014). It is thus crucial that city governments prioritise and strengthen community engagement processes (including with the research community) and private sector engagement (Bornstein, 2013). Creating diversity in systems is important (ResilientCity.org, 2016; The Resilience Alliance, 2016; Stockholm Resilience Centre, 2015), as evidence from several studies suggests that systems with many different components are generally more resilient than systems with few components. The presence of many elements often compensates for the loss or failure of others (Stockholm Resilience Centre, 2015). *Additional information and specific examples under each consideration are detailed in the full text available for download from the right hand column.